These light pleasant-tasting rolls complement almost any entree. 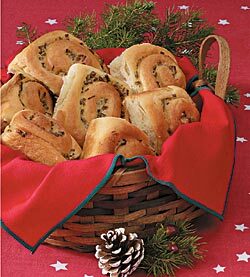 With the chive filling swirled through the golden bread, they’re attractive enough for special occasions. In a bowl, dissolve yeast in water. In a saucepan, heat milk, oil and mashed potatoes to 110 -115 F. Transfer to a mixing bowl; add yeast mixture, egg, sugar and salt. Add enough flour to make a soft dough. Turn onto a floured surface; knead until smooth and elastic, about 6-8 minutes. Place in a greased bowl; turn once to grease top. Cover and let rise in a warm place until doubled, about 1 hour. Turn dough onto a floured surface. Roll into a 15-in. x 10-in. rectangle. In a bowl, combine sour cream, chives and egg yolk. Spread over dough to within 1/2 in. of edges. Roll up jelly-roll style, starting with a long side; pinch seam to seal. Cut into 1-in. slices. Place cut side down in a quarter sheet baking pan (13" x 9" x 2"). Cover and let rise until doubled, about 1 hour. Bake at 350 F for 30-35 minutes or until golden brown. Brush with butter. Cool on a wire rack. Refrigerate leftovers.